Talk to a dozen folks who stocked grass carp. You’ll get a dozen stories of their satisfaction. What’s the best stocking rate? Bob got a call from his old friend, bass fishing legend Bill Dance. Bill wanted to know how many 10 to 12-inch grass carp he should put in a 70-acre lake that was 85-percent covered in coontail vegetation. Someone told him he would need 150 to manage just 10-acres. The source said 400 should be stocked in a 70-acres. After analyzing data from the visit, Bob recommended 150 in a 70-acre lake averaging four-feet deep. 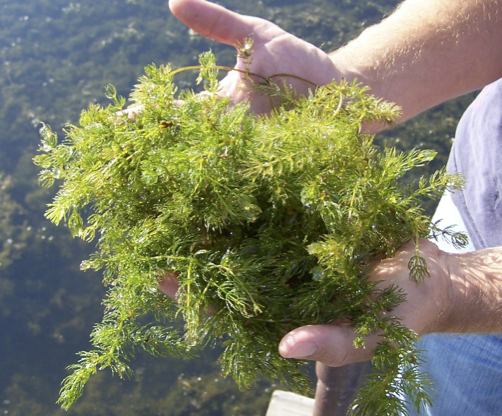 Lake owners don’t want to eradicate the plant, just control the pesky plant. It should take 150 grass carp about two years to eat two-thirds of the coverage. Stocking 400 would lead to faster results, but at that point, the lake would trade one problem for another. In the briefing, Bill mentioned the lake had zero permanent cover for fish. Those 400 fish would eliminate all rooted vegetation within two-years. By Bob’s logic, 150 are enough to thin some, but not all plants. That’s a good number for a maintenance program. Combine that stocking rate with a thoughtful spot treatment plan with approved herbicides. Give carp a boost by removing coontail in selected areas with herbicides. Carp won’t eat coontail where you direct them. They eat where they want to, thereby making gaps in plant masses. Grass carp have big appetites. They can weigh 55-pounds. Life cycles average 10-years. Bob’s experience suggests combining carp and herbicides to get best results. Treat areas needing immediate effect and let carp gradually finish the job. He tends to be conservative in stocking grass carp. After seeing consequences of stocking too many, he’d rather deal with coontail. Once carp are overstocked, it takes years to correct the problem. As plants are digested, remnants are released as fertilizer. This recycled fertilizer adds to a lake’s nutrient load and can have a dramatic impact on biology. It didn’t take one-year for the lake to be 85-percent covered in coontail. Trying to fix it in a short time leads to other problems that can be just as bad. This entry was posted on Monday, January 21st, 2019 at 3:38 pm	and is filed under News & Updates. You can follow any responses to this entry through the RSS 2.0 feed. Responses are currently closed, but you can trackback from your own site.